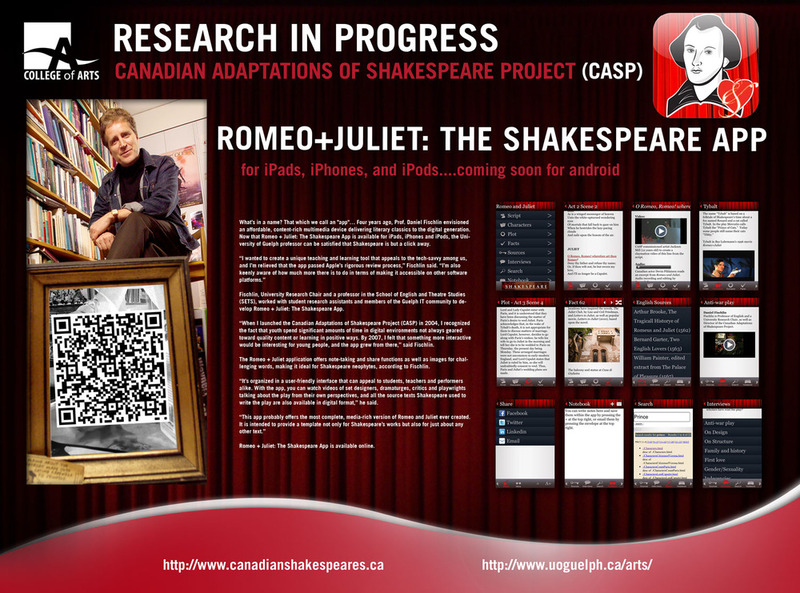 The Canadian Adaptations of Shakespeare Project in concert with InteractiveReaders Inc. is pleased to announce the release of its new Romeo+Juliet Shakespeare app. for Apple devices (iPad, iPhone, iPod). Click on this link to access the Guelph Mercury article on the app. Click here to access the Stratford Beacon Herald and London Free Press coverage of the app.’s release. On November 3, 2011 Dr. Fischlin also appeared on CBC’s Ontario Morning for an interview with program host Wei Chen about the Romeo+Juliet Shakespeare app. Click below to listen to the podcast version of the show. Note that the interview occurs at the tail end of the show. The full University of Guelph news release is below as well as here. What’s in a name? That which we call an “app”… Four years ago, Prof. Daniel Fischlin envisioned an affordable, content-rich multimedia device delivering literary classics to the digital generation. Now that Romeo + Juliet: The Shakespeare App is available for iPads, iPhones and iPods, the University of Guelph professor can be satisfied that Shakespeare is but a click away. Fischlin, University Research Chair and a professor in the School of English and Theatre Studies (SETS), worked with student research assistants and members of the Guelph IT community to develop Romeo + Juliet: The Shakespeare App. “When I launched the Canadian Adaptations of Shakespeare Project (CASP) in 2004, I recognized the fact that youth spend significant amounts of time in digital environments not always geared toward quality content or learning in positive ways. By 2007, I felt that something more interactive would be interesting for young people, and the app grew from there,” said Fischlin. The Romeo + Juliet application offers note-taking and share functions as well as images for challenging words, making it ideal for Shakespeare neophytes, according to Fischlin. “It’s organized in a user-friendly interface that can appeal to students, teachers and performers alike. With the app, you can watch videos of set designers, dramaturges, critics and playwrights talking about the play from their own perspectives, and all the source texts Shakespeare used to write the play are also available in digital format,” he said. 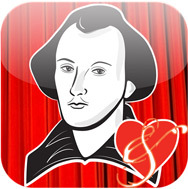 Romeo + Juliet: The Shakespeare App is available online.